With this summer being a scorcher it is very important to make sure we keep hydrated both during and out of exercise to ensure that the body has the correct fluids to function efficiently. Fluids are important for the functioning of the heart, brain and muscles and carry nutrients to the cells, flush bacteria from your bladder and does also prevent constipation. Of course, as the weather gets hotter we perspire more, without you really noticing. A lot of us say we 'forget' to drink enough water, or consume liquids in other forms such as fizzing drinks, tea, coffee or juice. And yes they may quench your thirst at the time but do they really do the job they are supposed to be doing? The body is about 60% water, give or take. You are constantly losing water from your body, primarily via urine and sweat. To prevent dehydration, you need to drink adequate amounts of water. There are many different opinions on how much water you should be drinking every day. Health authorities commonly recommend eight 8-ounce glasses, which equals about 2 litres, or half a gallon. This is called the 8×8 rule and is very easy to remember. However, some health gurus believe that you need to sip on water constantly throughout the day, even when you’re not thirsty. As with most things, this depends on the individual. Many factors (both internal and external) ultimately affect your need for water. We can also receive our water intake from food. Most foods are also loaded with water. Meat, fish, eggs and especially fruits and vegetables all contain significant amounts of water that we need. 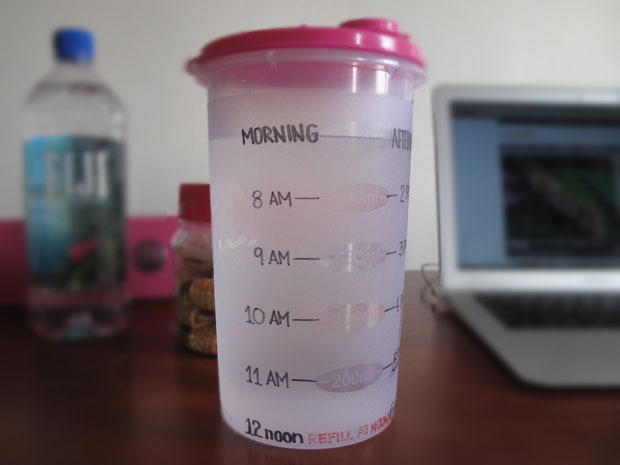 So what can you do to make sure you are keeping on top of your fluid intake? You can now purchase smaller bottles which also give you a time indication of when you should of drunk a certain amount of fluids. Giving a target and goal will help to remind and motivate you to drink those fluids to keep you going. So remember, train hard, sweat and remember to always re hydrate.